Almost an entire life at just one club. Carles Puyol, Xavi and Lionel Messi have agreed new contracts with Barcelona and their stay at Camp Nou means the side’s spine is now secure for many years to come. 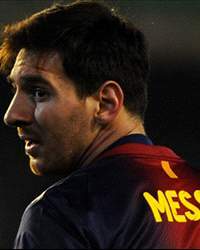 Club captain Puyol extends his current contract to 2016, while midfielder Xavi has agreed a two-year prolongation to the same date and Messi’s renewal sees his deal expire in 2018. The three spectacular symbols of what is widely regarded as the world’s greatest-ever club side are set to spend their entire footballing life at Barca. And many a Blaugrana fan will be happy about that. The contracts, of course, are shrouded in symbolism – the Catalan club are rewarding two of their greatest servants and most emblematic players (between them Xavi and Puyol have played well over 1,000 times for the Blaugrana) with lifetime deals. Barcelona, it is worth remembering, renewed defender Eric Abidal in 2011, even though the full-back was sidelined with a tumour in his liver and subsequently required a transplant which has kept him out ever since. 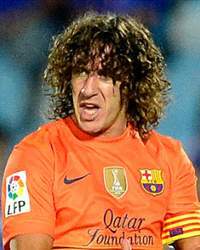 Puyol has had his problems with injuries and was sidelined for much of last season. The captain’s no-nonsense defending has seen him pick up perhaps more injuries than many others would; his bravery both admirable and astonishing yet at times counter-productive. Meanwhile, Xavi, at 32, has already played more games for the Catalan club than anyone else and has paled slightly as a player over the last two years. So can they really carry on for another three-and-a-half seasons? But both take care of themselves, too. 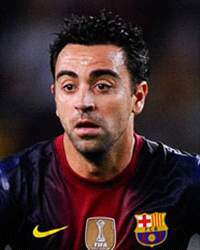 Puyol and Xavi are an example to their team-mates, leading healthy lifestyles with a focus on fitness and diet. They are doing everything they can to prolong their careers and Barcelona are reaping the benefits. Messi, too, changed his diet when Pep Guardiola took over as coach and the Argentine has since gone on to become the best in the world. Barca have sent a clear message to their rivals with this triple renewal: the spine of the world’s greatest club side is here to stay for some time to come.